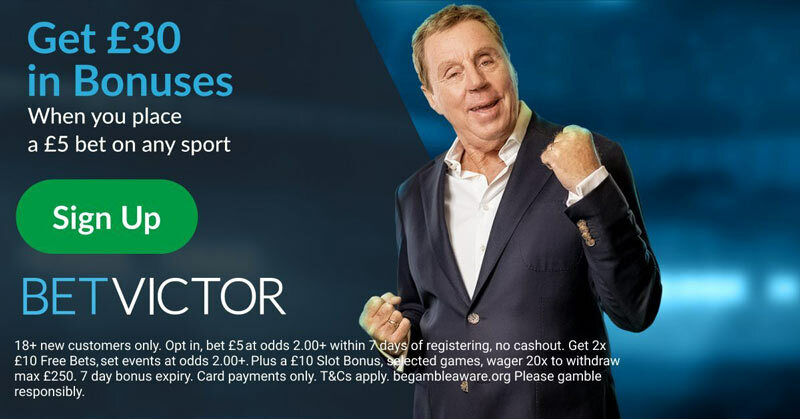 BetVictor are so confident that their football odds are the best out there so, if your 5-fold football accumulator (or above) wins and would have paid more with one of their main competitors, BetVictor will credit the difference in CASH! Hence there is no need to place your accas anywhere else other than at BetVictor.com. What is BetVictor Price Promise? BetVictor, who have been named the best price on the most UK football matches for the past five seasons, have decided to introduce the 'BetVictor Price Promise' to their customers and the brand new offer for football accas of 5-fold or above has taken the industry by storm since its launch. The Price Promise offer applies to all accumulators of five more teams and works in a similar way to the popular Best Odds Guaranteed in horse racing. Basically, if your football 5-fold or over win/lose/draw acca would have paid more at another bookie, you are sure BetVictor will pay you the difference you could have made elsewhere. Speaking to SBCNews, BetVictor's director of sportsbook Matt Scarrott said: "We are convinced it will be a huge hit with customers, old and new, and our message to the football bettor is simple; why bet elsewhere when we guarantee the best price available and will refund your stake if one leg lets you down?" How do I get Price Promise on my Football bets? Of course, you need a BetVictor account. If you don't have it, we recommend you to join BetVictor immediately and you will also automatically qualify for a £40 free bet! Then, in order to get your Price Promise boost, you don't have to do anything! Simply place your accumulator at the normal prices on site and, when it comes to payout, if it turns out that your bet could have been placed at higher odds elsewhere then you will get paid at those odds. How are BetVictor Price Promise pay-outs calculated? Individual match odds are monitored by an independent third party (TX Odds), the odds are then combined to give an accumulator price, the prices at the time you place your bet are then compared with the actual price you received with BetVictor, your account will then be topped up the following day (although this may take 48 hours in exceptional circumstances) to bring your winnings up to the maximum you could have won with their competitors. BetVictor Price Promise guarantees you the best price at the time you place your bet, changes in price over time are not taken into consideration. Competitors refers to the following online bookmakers: Bet365, BetFair (Sportsbook), Betfred, Coral, Ladbrokes, PaddyPower, SkyBet or William Hill. Prices from other bookmakers will not be taken into consideration. Are there any leagues that don't qualify for BetVictor Price Promise? No, your bet can be across any football competition that they offer odds on. 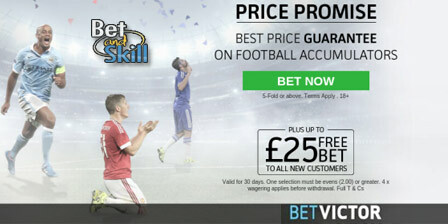 "BetVictor Price Promise: Best Odds Guarantee on Football Accumulators"